Hi everyone! I was noticing my kids needed some extra help staying positive over the school break last year :-) and so I created a 30 day gratitude challenge for them. Especially over the Christmas holiday season they were struggling to keep their minds on the reason for the season. Daily discussions centered around gratitude and a family volunteering project really turned their focus off of themselves (and their wish lists!) and on to Jesus and the reason WHY he came to the world in the flesh. We talked a lot about loving others, and spent intentional family time counting our blessings. 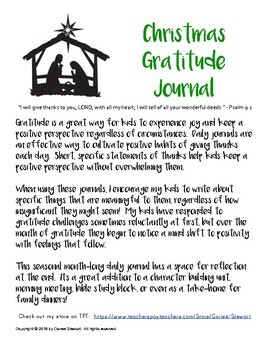 That's the original reason why I made these seasonal gratitude journals. We've kept up the practice throughout the year. These journals help guide our ship through the year, keeping our minds on things above. These journals were such a hit with my family, I thought I ought to share them with anyone else who might find them useful. This simple 31 day journal gives space and encouragement for kids to write one specific thing they are thankful for each day. Over the month we check in and discuss our many blessings, and truly I noticed a shift in their mindset from complaining to grateful, which was especially a blessing as we navigated the crazy change in routine over the holidays and breaks. 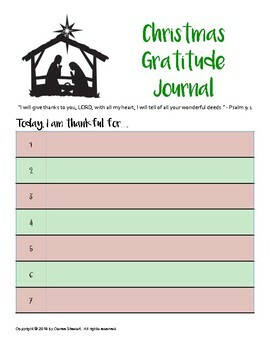 I've made one for each season and we to keep using them season after season to continue cultivating habits of gratitude and positivity. This download includes a 5 page, 31 day (numbered 1-31) gratitude journal for WINTER. There are two reflection questions at the end.